Kota Kinabalu is the capital of the state of Sabah located on the island of Borneo. This Malaysian city is a growing resort destination due to its proximity to tropical islands, lush rainforests and Mount Kinabalu. There is a lot to do in Malaysia and Kota Kinabalu is becoming a popular tourist spot. It offers both the cultural stuff and loads of activities that suits even type of tourists interests. 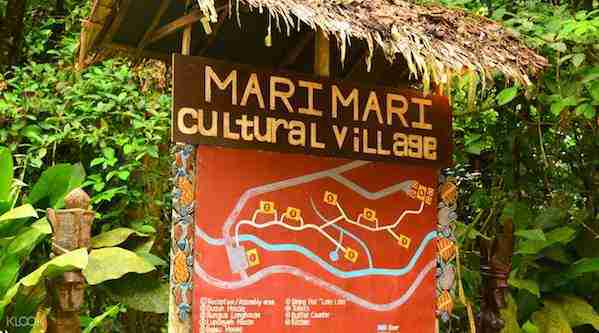 Activities include diving, technical diving snorkelling, island hopping, parks, Sunday markets, sailing and scenic views. The climate in Kota Kinabalu is all year-round has temperatures of 32°C. Rainfall increases from May till September. Here’s our list of the places to visit Kota Kinabalu. 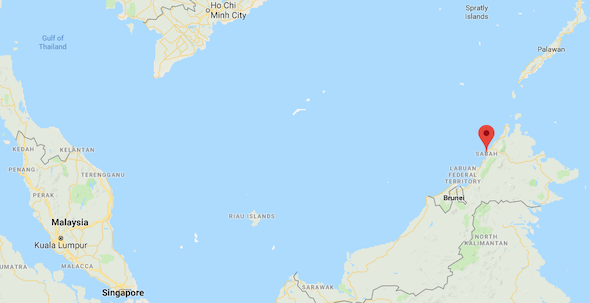 Where is Kota Kinabalu Malaysia on the Map? Kota Kinabalu City Mosque is the second most important mosque in the whole Kota Kinabalu after the State Mosque, located in Sembulan. The mosque sits on a 14.83 acre site and on the shores of Likas Bay, on the South China Sea. It was a blend of modern and Islamic architecture and it has a maximum capacity of 12,000 people. The mosque features an ATM, a palliative care clinic, a fish farm and much more. The man-made lagoons surrounding the mosque gives its visitors an elegant and dramatic look, especially on a full moon night and is the largest mosque in Kota Kinabalu. 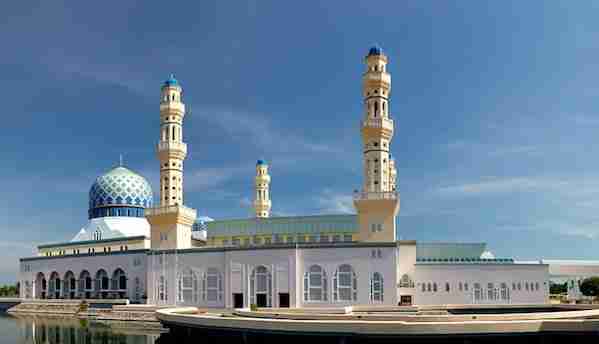 The opening times of the Kota Kinabalu City Mosque is generally between 8am to 5pm. Its closed on Fridays. There is tours of the mosque available. The Tunku Abdul Rahman Park is a group of five different islands, which are Pulau Gaya, Pulau Sapi, Pulau Manukan, Pulau Mamutik and Pulau Sulug. There are loads of beach activities that the Tunku Abdul Rahman Park organizes. However, all these beach activities require a prior booking. You can do various water sports like snorkeling, scuba diving, swimming and and see coral and marine life of the island. The island tours can be booked on the spot from where you will take your ferries. 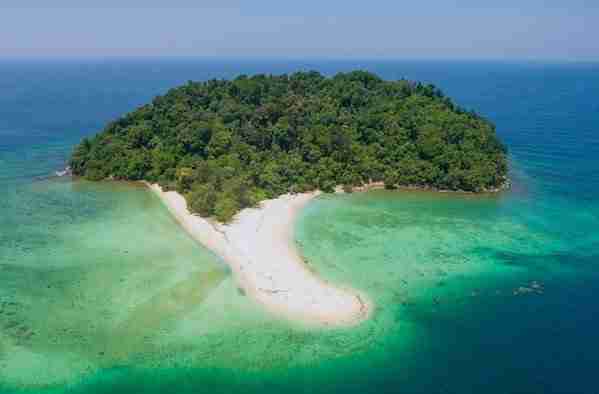 Today, Manukan Island is the second largest island in the Tunku Abdul Rahman National Park and Malaysia’s first marine national park. Manukan Island is surrounded by a protected coral reef, and the island boasts a pristine rainforest and beautiful white sand beaches. The island offers accommodation, coral reef, beaches, snorkelling, diving and swimming. Sapi Island is another island in Tunku Abdul Rahman Marine Park. Its smaller than the Manukan Island but you can still find a good crowd here. The island offers accommodation, coral reef, sand beaches, snorkelling, diving and swimming. The Sepilok Orangutan Rehabilitation Centre is focused towards the rescue orphaned orangutans who have been left to fend for themselves due to illegal poaching and logging. While keeping them in their natural habitat. You can feed them from the feeding platforms with the help of rangers and take photos. 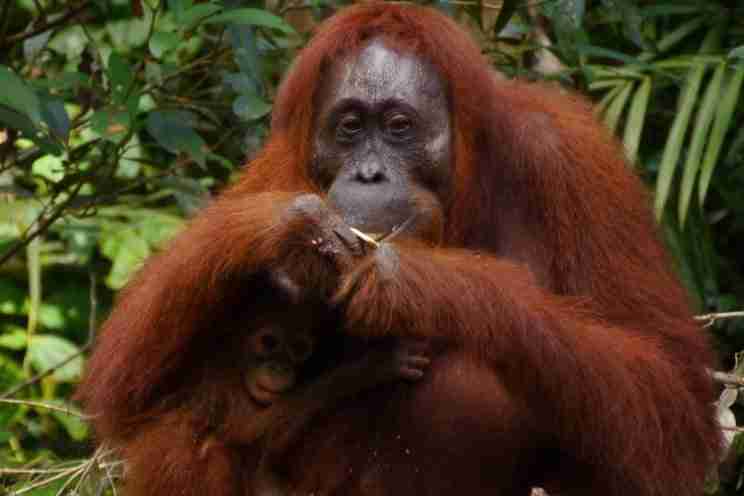 The opening times of the Sepilok Orangutan Rehabilitation Centre is generally between 8am to 5pm. Entrance fee is RM30 for adult and RM15 for child. Tanjung Aru food court opens from 12pm onwards until late. Here you find local food under one roof. It offers wide range of local foods such as local desserts, banana shakes, baby coconuts and delicious juice. It is a great option with numerous stalls selling Nasi (rice) variety dishes with fish (Ikan), chicken (ayam), egg (goreng), chili for about 4-7 MYR per dish. This gives you a panoramic view of KK city. Has a little cafe for you to hang around. Admission is free and it opens from 8am – 12am. You have the option of doing an uphill trekking where you can walk up there or you can just take a cab. There the sunday market that’s worth a look. The sunday morning market is great way to pass an hour, it starts as early as 5.30am in the morning until 1pm. A wide variety of stuff is available including fruits, vegetables, kittens, puppies, bags, clothes, etc. Its reconstitution of living places of 5 tribes of previously head hunter tribes by descendants of the tribes men. A guided tour offers a lot of new things to learn about their life in the forest at each stop, their cultural and culinary habits, their tools and costumes. The visit is concluded with a dance and music show, then a light lunch. The entrance fee starts at RM180 for adult and RM160 for child. Kota Kinabalu’s Tanjung Aru beach is located near the airport just four miles south of the city center. The sunset can be beautiful if you are lucky. The sea looks beautiful and the scenery but isn’t the best for swimming. A food court right on the beach offers fresh, low-cost seafood as well as fruit and drinks nightly until midnight. The Lok Kawi Wildlife Park is 280 acres in size and is made up of two parts; the zoological and the botanical side. 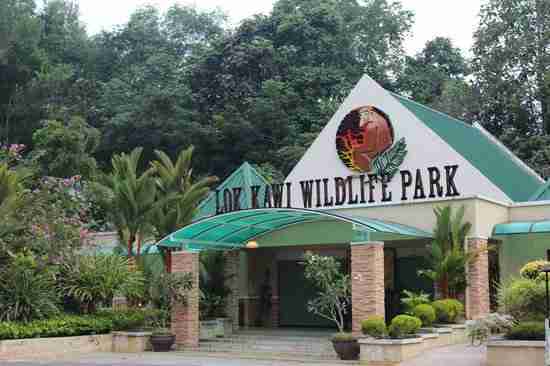 Located 30 minutes south of Kota Kinabalu by bus, Lok Kawi is a wildlife rehabilitation center. Among the many residents of the zoo are the Borneo Pygmy elephants, Sumatran rhinoceros, Orang Utan, Proboscis monkey, Malayan Tiger as well as a few species of deer and other endangered species can be viewed. There is an animal show at 11.00 am, that is entertaining. You can experience the animal feeding which ends by 2.30pm. Need to take note that the animal show or animal feeding will not be carried out if raining. Carry with you some water, light food. This involves taking a journey back into the colonial days of British North Borneo on board the North Borneo Railway. The British Vulcan Steam Engine Train, fueled by wood, runs gently from Tanjung Aru through the towns of Kinarut and Papar and returns on the same route. Tanjung Aru Station, dates back to the 1900’s. Depart from the Tanjung Aru Station and make your way to Kinarut town inside the British Vulcan steam locomotive, making stops at Tien Shi Temple and traditional shops. And returns on the same route. See the scenic paddy fields, rubber trees, villages along the railway and their “smiling” lifestyles along the way. 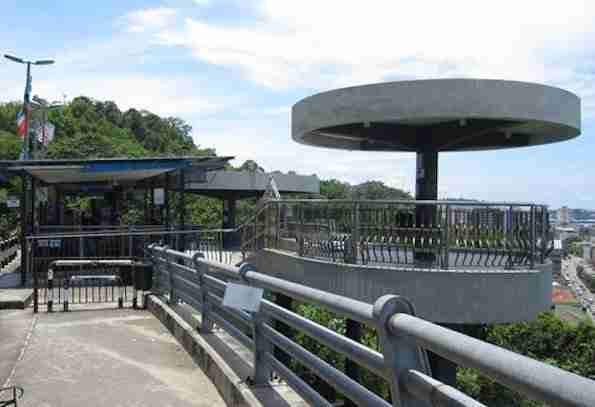 If you are looking for some scenic views of Kota Kinabalu then Kokol Hill is a place you must go. It is a place, which can give you a perfect view of Mount Kinabalu and you can also enjoy a serene and sunset. Kota Kinabalu is littered with guest houses, hostels, and hotels. Here are a few places to check out if you are planning to visit Kota Kinabalu. Remember to check reviews and book a place that suits you interests while traveling. Grand Borneo Hotel is located in 1Borneo Hypermall, Sabah’s largest shopping mall. The stylish accommodation offers a grand indoor pool, 2 dining options and modern rooms with free internet. Grand Borneo rooms are air-conditioned. Each well-appointed room is equipped with tea/coffee making facilities and a flat-screen TV with cable channels. Manukan Island Resort by Sutera Sanctuary Lodges offers views of the South China Sea. It features an outdoor pool, a restaurant and spacious villas with private terraces and dining areas. Offering room service, air-conditioned wooden villas at Manukan combine traditional and modern elements. They are equipped with a private bathroom and satellite TV. Finally, there is so must to do in Kota Kinabalu with loads of resorts, restaurants, activities and bars to keep you busy. Kota Kinabalu is the place to go if you want to relax on the beach or island hop with much more to do. And that’s it for now! I’d love to know if this guide on places to visit Kota Kinabalu Malaysia has helped you. Let me know if you have any questions and let me know if you go.